Today is really Trixie's turn to star in the Caturday Art Blog Hop hosted by the beautiful and wise Athena and her Human, Marie, but since Thursday was my Gotcha Day, she furry generously gave up her place to Me, Caspurr, King of the Tigger-Tabbies. She is such a good sisfur, and when I was gotcha-ed, six years ago, she taught me effurrything that a little kitten needed to know! Sometimes, I don't show my appurreciation propurrly, but I want to take this oppurrtunity to say "thank you, Trixie". And, of course, a huge "thank you" to Mummy! Thank you, Caspurr, for honouring My Our humble abode with your mancatly presence - Queen Trixie and Shimona (aka Mummy). We couldn't celebrate My Gotcha Day on Thursday, because Mummy was busy. She appeared in a concert with her Caterwauling Friends - and even had a so-low. In fact, she has been furry busy with all sorts of things the past few weeks. She has written about some of them in her own blog, and will try to write about more of them over the next few days - if She can find the time, because NOW, she is busy with her Pessach (Passover) cleaning! The picture below was taken in 2014, when I had already been with Mummy and Trixie for almost a year. As you can see, it didn't take me long to feel completely at home (mol). 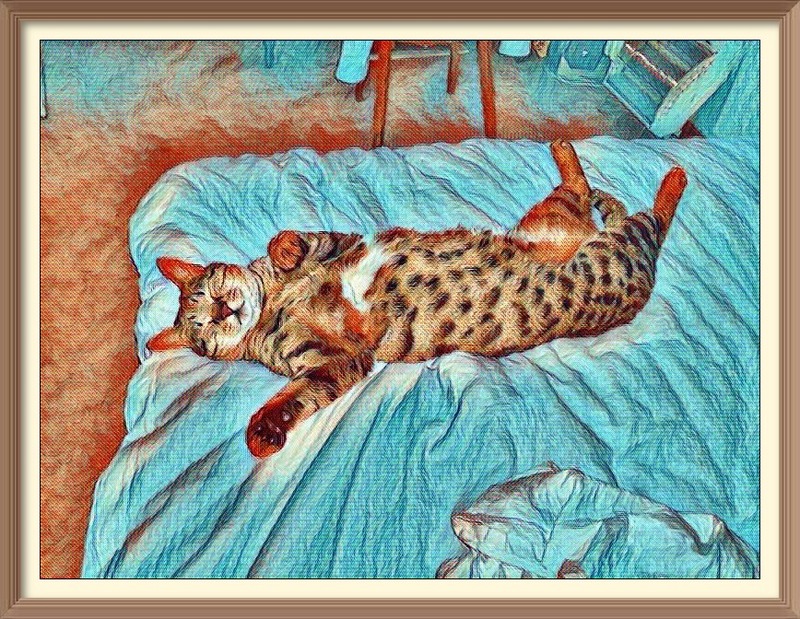 We used LunaPic's Van Gogh effect and added a picture frame. Now, before We join the Blog Hop, as usual, we want to wish you all Shavua Tov (a Good Week), and We hope you will also be enjoying some lovely spring weather! Okay! Let's get ready to blog hop! 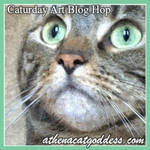 Thanks for sharing your Caturday Gotcha Day Art. We just love it. Like you said, you didn't take long to feel comfortable. Great artwork. Have a lovely rest of your weekend. What a precious picture, lovely art! Happy Gotcha Day! Your art is lovely. Beautiful art! Hope your Gotcha Day was just purrfect. Well, Happy Gotcha Day, whenever it was. This is beautiful! Happy Gotcha Day! Lettin' it all hang out is the highest art form. Happy happy Gotcha Day! Love the artwork! A belated happy Gotcha Day, Cas-purr- and many more ! You are one comfy cat! We hope you had a meow-velous Gotcha Day, Caspurr!